Exciting to look at, a technology treat: In a test by German bike magazine aktiv Radfahren the STEVENS Super Prestige is awarded a “very good” grade and a recommendation from the editors. Already last year no bike has been seen more often in hobby races as the STEVENS Super Prestige, the aktiv Radfahren editors say. With its weight reduced to 1,000 grams in size 58cm, increased lateral stiffness and improved comfort thanks to more vertical compliance it has obviously become very popular. The fact that three cyclocross world champions – Wout van Aert, Sanne Cant, and Ben Tulett (U19) – also ride Stevens’ top cross model is even more proof of its qualities. When riding gearing, tires and the comfortable handlebar made the bike easy to steer and to handle. “The Super Prestige is a pleasure especially on rough terrain and impervious to roots and coarse rubble.” So the testers often made detours over more technical trails where the Super Prestige willingly obeyed. Conclusion: Exciting to look at, a technology treat, and a cornering genius – the Super Prestige has everything to make off-road cycling fun. 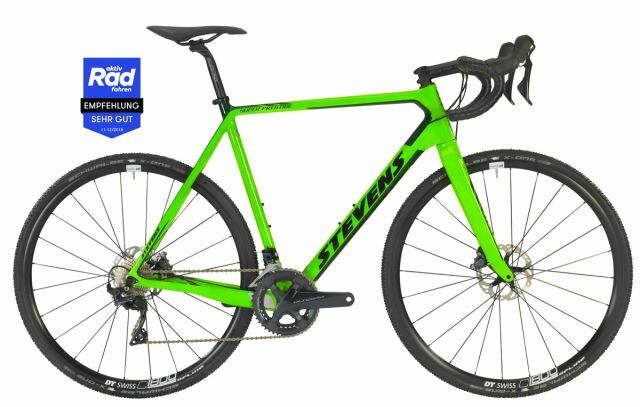 The STEVENS Super Prestige with Shimano Ultegra is available for 2,999 Euros at your certified STEVENS dealer in Neon Green and in Ink Black. Available in sizes 50, 52, 54, 56, 58, and 60cm. With Shimano Ultegra Di2 Super Prestige Di2 is available in the same sizes in Ink Black for 3,799 Euros. The new Super Prestige Force with SRAM Force drivetrain and Easton carbon cranks is also available for 2,999 Euros.